To sum up the Steampunk in one word, it would be the survival. There is a no bigger anachronism in today’s technological age than a watch. We are not in any need to carry the clocks anymore. Fortunately, these mechanical marvels are still the perfect steampunk accessory in every way. In this piece of writing, our focus will be on the top-ranked steampunk watches that you can ware with any steampunk attires, goggles, and hats. The list is all about the tasteful timepieces that can be worn at work resembling the art installations that speaks more than watches. It does not matter which occasion is there and why you need to wear a steampunk watch, you will find the best one for you. When it is about steampunk watches, everyone has own choice. It is a personal decision and to be honest, there is not anyone best steampunk watch that can be recommended. What may complement or suit one person might not have the same position for the other position. This ultimate attractive steampunk watch resides in an engraved black coloured case. It is indeed a great fun to flip the cover open and look at the time. No, you need not do this. The designer of the watch has added a facilitating window so that one may see the time and hands of the watch without having the case opened. The classic Roman numerals well paired with clean lines of the watch take the credit of making it a worth wearing accessory with any of your beloved steampunk outfit. 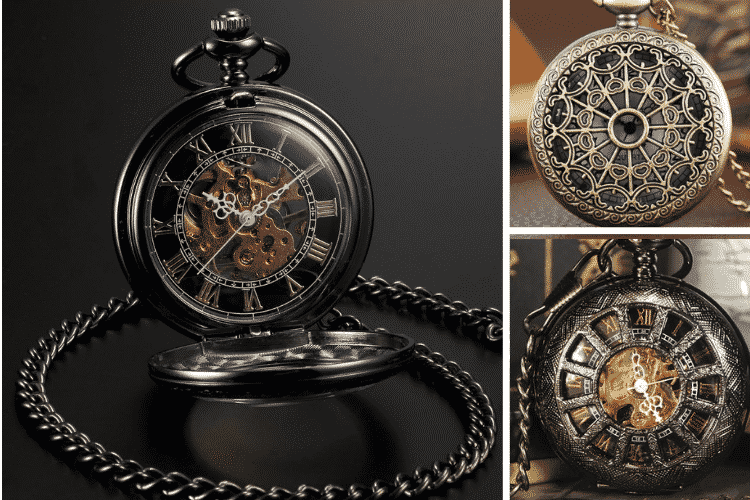 If you are a pocket watch person, then this particular Steampunk pocket watch will have you covered in every manner. It is an elegant and attractive black coloured timepiece with a chain. It has been well coupled with several shiny gold details. If you are a lover of whirls, gears, and old-fashioned watch hands, then you will be in love this watch wholeheartedly. You can buy this wonderful hand watch just at $10.61. This is one of the watches that are stylish and trendy enough that can be worn with all kinds of steampunk costumes. The watch has been deliberately designed to complement your steampunk aesthetics at their best. The watch is offered with complex features meeting requirement of feature crazy people. These features include an extra dial, a key, and several other components. Possessing and then wearing this exotic watch will make you feel a real-life scientist from your favourite steampunk film. It does not matter if you want to buy this watch for you or your loved ones, you will definitely end up having a perfect piece. You will have to spend only $45.47. The watch is housed in a shining yet attractive spiral of Pewter which is reminiscent of powerful magical crafts. Though it does not feature Victorian aesthetics, however the thick band, the complex lines, and retro styling of the watch make it a perfect addition to the steampunk wardrobe. Just looking at the watch will give you an ultimate royal feeling in every manner. It is sleek, sophisticated, elegant and royal in every possible manner. You can enjoy possession of this watch for $104.97. This metallic watch has been designed with a wonderful dial. It has been equipped with several accents which makes it a must steampunk accessory. A simple chain keeps the watch secured and at the same time does not allow the old-timey aesthetics lose its grandeur. It depends on you if you want to wear it for attractive looks or you are willing to keep track of the two time zones simultaneously. The watch can be bought in just $45.47. It is all fine if you want to buy it for you or willing to gift it to your loved ones; it will serve both the purposes. To conclude this discussion about pocket watches, it would be very right to say that no doubt smartphones are around us; the significance of watches is still there. People still invest enormously in watches and therefore steampunk fashion is incomplete without these watches. In order to have more of these watches, you can always rely on SteamPunk Desk. We are there to serve the Steampunk lovers with clothes as well as accessories to enhance the overall look at our best. All that you should do is to access our official site i.e. www.steampunkdesk.com and see how we can don you with the best steampunk theme. Allow us to serve you once and you will come back to us again and again.